A rock scramble of Mt. Worthington. There are two routes listed here: one as described in Olympic Mountains: A Climbing Guide, and the other uses an alternate route up Copper Creek. Drive US-101 to just east of Sequim Bay State Park. Turn south onto Louella Road (also marked with sign to Dungeness Trail). Drive Louella Road to Forest Road 28 (follow signs to the Dungeness Trailhead) and turn right onto Forest Road 2880. Drive Forest Road 2880 10.6 miles to the Dungeness River Trailhead, turn left to cross the Dungeness River and onto Forest Road 28650. Continue 3.7 miles to the Tubal Cain Mine Trailhead (3,200 ft). Drive US-101 to Penny Creek Road. Turn west onto Penny Creek Road, drive 1.5 miles, and turn left on Big Quilcene River Road. Follow Big Quilcene River Road for 3 miles, and then bear right onto Forest Road 27. Drive 7 miles, turn left onto Forest Road 2750. Follow the road until it ends at the Tenmile Shelter and the Big Quilcene River Trailhead (2,500 ft). Hike the Tubal Cain Mine (Copper Creek) Trail toward Buckhorn Pass. In ~3 miles, pass the side trail to Tull Canyon, and ~0.5 mile farther cross the stream at the site of the old mine. The trail then switchbacks up through meadows of wild strawberry and flowers. On the left across a valley see Mount Worthington, Iron Mountain, and Buckhorn Mountain. At ~5,200 ft take the side trail down to Buckhorn Lake. Close to the lake, the path becomes faint and wanders in small trees. Pass around the south (right) end of the lake, or keep above it. The route begins in a flat, open area of avalanche debris south of and ~200 feet above the lake. From here go directly up a very wide gully towards the summit. Ascend up through the rock band at the top of the wide gully and then angle right to gain the flat, open summit plateau. The summit (6,938 ft) is to the left in ~0.3 mile. The 40-foot summit block is a bit technical—some scramblers may want a rope. Extend your trip by adding Iron Mountain (6,826 ft). Climb it from the Iron-Worthignton saddle. It makes the trip 16 miles round trip with 4,500 feet of elevation gain. Hike the Big Quilcene River Trailhead, No. 833. In ~2.7 miles, reach Shelter Rock Camp (3,900 ft). From here, climb north towards the saddle at 6,100 ft that runs east-west between Mount Worthington and Hawk Peak. From the saddle, climb west on steep rock to the summit. 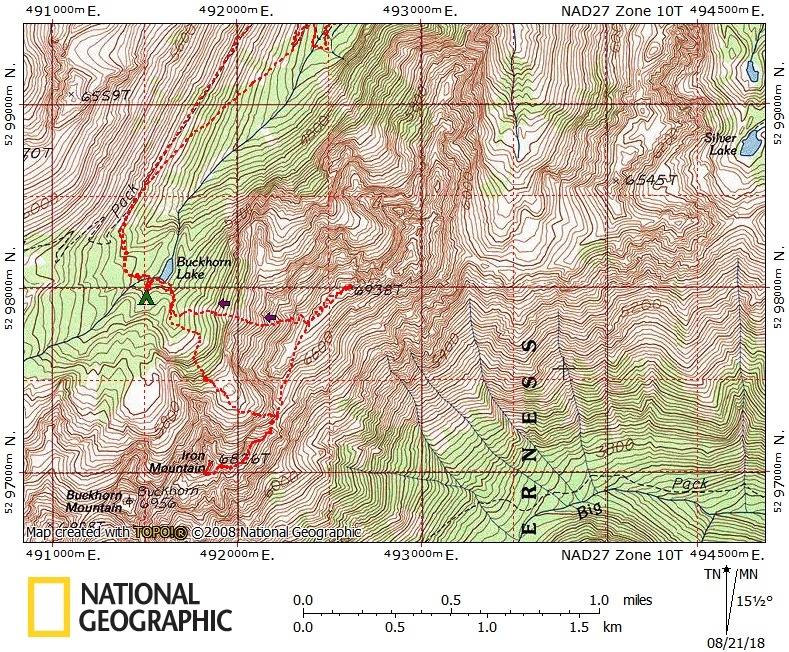 A topo map of the route to Iron Mountain and Mount Worthington done with National Geographic TOPO! by Brett Dyson Aug 2018.